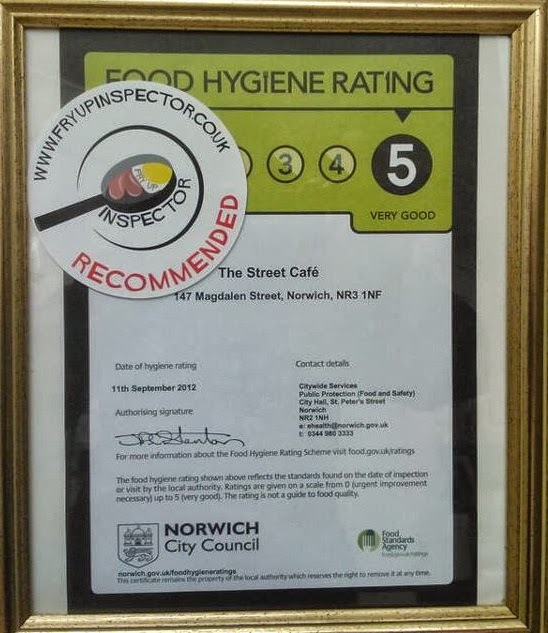 Not much has changed at The Street Cafe in Norwich since my first visit in 2010 and that is a good thing as they have a winning formula which makes it so popular. One recent change though has taken their already excellent breakfast to a new level, they now serve Archers award winning sausages! The sausage that won this years Battle of the bangers at the Norfolk food and drink festival, read about it here. Inside is traditional and clean. Fresh flowers can be found on each table. Meat eaters and vegetarians will be spoilt for choice with three different sizes of each breakfast and a good selection of extras. There are plenty of drinks to choose from too. This regular cappuccino cost £1.90 and was excellent. I was equally impressed with the Heinz ketchup and HP sauce, no economy sauces served here. When the impressive looking bumper breakfast arrived I knew I was about to eat something special. Toast was an option but I chose soft white buttered bread to wrap around some bacon. The pair of Archers sausages proudly held back a sea of thick stodgy beans. The black pudding I had ordered as an extra lay across a mountain of mushrooms. The fried bread served here tastes quite light and seems a bit healthier as it isn't drenched in oil. The bacon was excellent but it was the sausage I was eager to taste again! My favourite sausage ever, the taste and texture is spot on! A great egg yolk on a great free range egg from Coltishall Dairy Farm. The sign of an excellent breakfast! My wife went for the medium veggie breakfast. The buttered toast that came with it looked really nice. 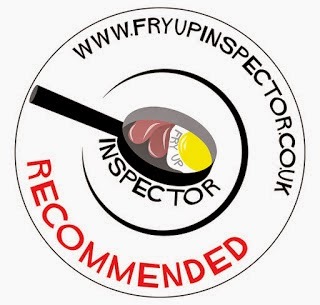 Recommended and a five star food rating is well deserved! Back in 2010 when I started this blog my first fry up inspection took place at The Street Cafe in Norwich. I was off to a good start with the impressive breakfast served there, the original review can be found here. I recently heard that the Archers winning sausage from the 2013 Battle of the bangers was now being served at The Street Cafe, I decided to revisit and re-write the breakfast experience at The Street Cafe..
Veggie option - Yes, vegetarians are well looked after here and Quorn sausages are served. It had been a while since I had last eaten breakfast at The Street Cafe and everytime I passed it I kept thinking that I must return again soon. It was my birthday so it seemed to be a good option for a birthday breakfast. When the breakfast arrived it was as impressive as ever and beautifully presented! Archers sausages remain my favourite sausage ever, they go so well with this breakfast. This time I tried the homemade bubble and squeak, nice and crispy on the outside with a delicious creamy centre. The Old English Breakfast is a new addition to the breakfast menu. I usually have a cappuccino with my breakfast but couldn't resist a strawberry milkshake today, delicious! 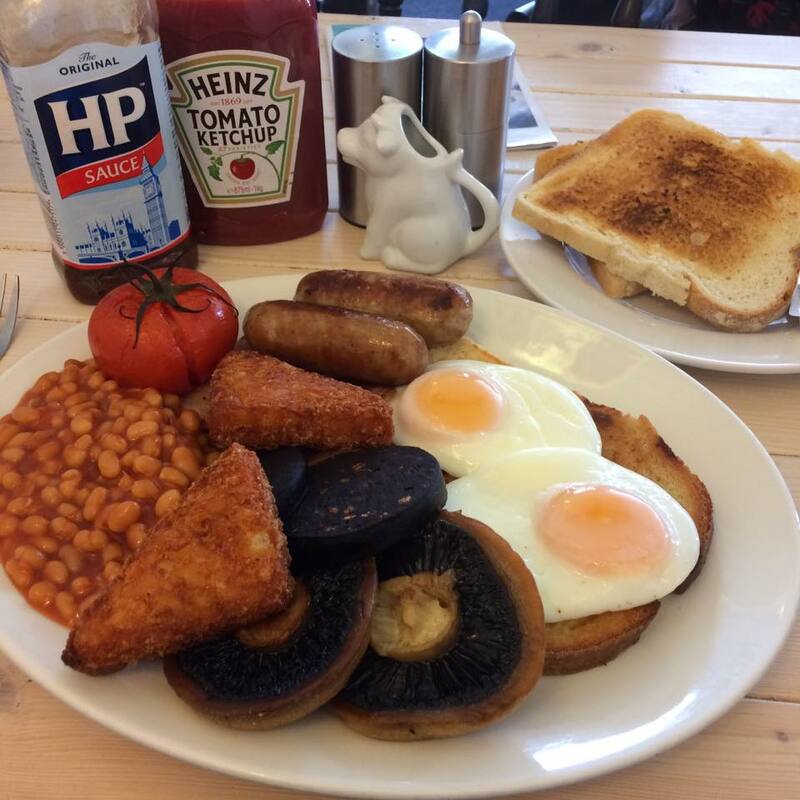 The Old English Breakfast includes 2 Archers sausages, 2 bacon, a thick slice of black pudding, a slice of griddled bread, a large flat mushroom and a tomato. As always at The Street Cafe everything tasted excellent and was cooked to perfection by Andy, he certainly knows how to cook and present a breakfast to be proud of! The Old English breakfast also comes with 2 slices of toasted farmhouse loaf (from Ketts Hill Bakery) served with real butter. My wife chose the small vegetarian breakfast and added a flat mushroom and bubble & squeak, she loved it! Following a look around the annual Magdalen Street Celebrations I decided to call into my favourite Magdalen Street cafe. On this visit I spotted the cow milk jugs, we loved them! As always the breakfast here was beautifully presented and a real pleasure to eat! The Street Cafe was a great choice when decided to go out for a Valentines Day breakfast. Excellent service, great tea cosies and a breakfast that looked perfect and as always, tasted amazing! I'd been craving a Street Cafe breakfast for a few weeks now and what a wonderful sight this was as it was placed in front of me, perfect! Since our last visit a vegan breakfast had been added to the menu, my wife ordered it. A great breakfast with a really nice scrambled tofu to replace the eggs, delicious! I'd woken up craving a really nice full English breakfast so decided to head for The Street Cafe. I ordered the bumper breakfast with a mug of tea, the food and service as always was spot on. Just look at those perfect eggs! An aerial shot of the bumper breakfast with black pudding and the vegan breakfast, both stunning! It was cold and icy outside so a visit to The Street Cafe seemed like the perfect plan. Everything was cooked to perfection and the service was impeccable! On this visit I decided to check out the smoked bacon bubble and squeak, it's really delicious! Street Cafe also serve white pudding now as well as black pudding so be sure to order some as an extra. Went there for brekkie before the beer festival Friday lunchtime session last year - REALLY hit the spot and kept us going through until tea-time. Also went there only this last Saturday after previous night on the beers with the lads. Hit the spot both times. Best in Norwich I reckon overall. But, worry not, they're merely doing up / renovating the place, same people own it apparently and I understand will be open again very soon. Better get back in there soon to re-sample and see if a new shade of buttermilk on the walls has affected the fry-ups (any excuse! ).